Because of their weak sucking, these babies require perseverance and expert lactation consultant advice, but brain-building with mama’s help is the best way to start. Take advantage of early intervention programs available in your community. Feed your infant a real-food diet. Remember, a baby’s brain is 60 percent fat, and a child with Down Syndrome needs all the extra brain help they can get. Starting with avocados at 6 months old and salmon at 7 months old is what we advise in our pediatric practice. A real-food, pure diet, free of artificial additives, is an absolute must for children who already have neurological sensitivities. Remember, of all the organs of the body the brain is most sensitive to poor nutrition. 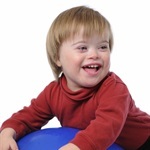 The top medical problem in children with Down Syndrome is childhood and adult obesity, which then leads to a downward spiral of diseases that are consequences of obesity: Type II diabetes, arthritis, and inflammation problems. Many of these children do not have wise appetite control. This is one of the things that we have learned with our son Stephen who is now lean and buff. (Remember, lean does not mean skinny, but rather means having the right amount of body fat for the child’s individual body type). Besides a real-food diet, we got Stephen into sports early on (t-ball, baseball, flag football, swimming, karate, basketball, golf, and so on). Swimming is one of the best exercises for children with any developmental difference. Explore the options of full inclusion in your school system. Be sure to be your child’s advocate on education and the use of all the developmental early-intervention programs available. Our Stephen was in mainstream classes from 5 to 10 years of age. Even initially reluctant teachers, at the end of the school year, concluded that Stephen was much more of an asset than a liability to the class. I remember when Stephen was in the second grade and the teacher asked all the children to comment on whether Stephen was good for the class or not. Twenty-nine of the 30 children responded, “Absolutely yes!” It’s vitally important that you get the teachers on your side and get them to want to help you, not because the law says they must, but because it’s the human thing to do. Find out their special something. Every child has a special ability for which they can be a star. Find out what makes your child shine. For Stephen, it was sports and hitting a baseball. For others it could be music. You will be surprised how many children with Down Syndrome have a hidden talent that will amaze you. When they excel with that one talent, it has a carryover effect to their whole self-esteem and their feelings that they are truly more alike than different. The Special Olympics is an absolute must for children with special needs. I still remember the day when Stephen was 5 years old and joined a typical t-ball team with typical children. The jerk-coach on the other team showed an attitude of, “What’s that kid doing on a team of normal kids?” When Stephen came up to bat we took the ball off the tee and I pitched to him. He hit a home run. He was the only child on that whole team who could hit a pitched ball and didn’t have to use a tee. The other coach learned a valuable human lesson that day. Because of Stephen, yes, we have more gray hairs, but we also have learned a whole new language of childcare; because we had to. He taught us patience, perseverance, and how to be a child advocate. And, he upgraded our sense of humor. We learned to appreciate and focus on how unique he is – especially sympathetic and caring. These kids love pets, babies, and helping people. We loved to watch Stephen and his “girlfriend” relate as she straightened his tie as they walked into the Special Olympics dance together. Again, kids with Down Syndrome are more alike than different.